Take a strange old castle-like building with a long, weird history that occasionally involved space aliens and copious amounts of alcohol. Add to that a troupe of fairies and satyrs, and a creative team that wants to "abandon the ordinary and step into another realm," while also showing off the newly restored interiors of Ashlar Hall. "Rites of Spring" is a different show every night, with a different musical performer kicking things off. Local favorites Star & Micey play opening night. After that, different performers will play a short set each night with styles ranging from musical theater diva Annie Freres to guitar picking Memphis songwriter Mark Edgar Stuart. 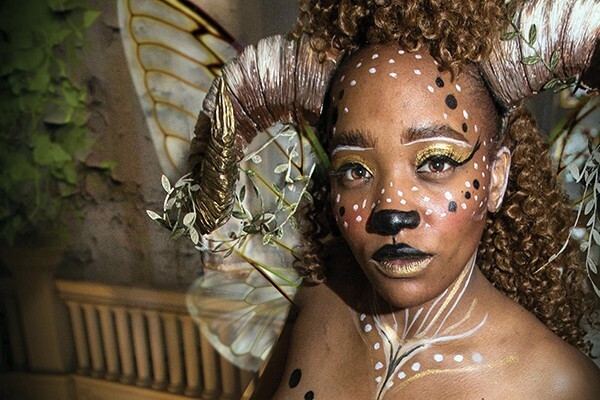 "Then, after the music, we have these magical creatures doing the rites," director Julia Hinson says, trying to describe events that will unfold across rooms that have been turned into temporary art installations. "We sort of have this idea that the house has been taken over by these magical creatures. They are kind of rebirthing it into the present. And the magical creatures will invoke the ballet dancers for a ballet that weaves through the house." The magical creatures don't fade away after the ballet ends. "They'll interact with guests and live their lives in the enchanted castle," Hinson says. Ashlar Hall was built in 1896 for Memphis real estate developer Robert Brinkley Snowden. It has since been a restaurant, a nightclub, and a sad abandoned space. It was purchased in 2017 by Memphis area real estate investor Juan Montoya, who's been steadily restoring the mansion. "With an immersive show, you just don't know what people will do," Hinson says. So the performance repeats itself, giving audiences an opportunity to explore things they may have missed the first time.